Michael Stern Hart was born in Tacoma, Washington, on March 8th 1947. Tomorrow is his 65th birth anniversary. On July 4, 1971, he had typed the text of the U.S. Declaration of Independence into his computer and transmitted it to about 100 other users on the University of Illinois computer network. That was his first step towards developing the on-line library ‘Project Gutenberg’ which today has over 38,000 books in 61 languages available for free reading, on any desktop or laptop computer, on iPad, Kindle, ePub and even on a mobile phone. They are all books on the public domain, or copyrighted works for which he got permission to reproduce. Today the project also provides audio books and music. Some called him the father of the E-book, and Hart is known more as the founder of Project Gutenberg, He had used the name Gutenberg after the man who created the first practical printing press. In a way the name is ironic, because till Gutenberg showed the way for commercial scale publishing of books. All written material, from the first clay tablets, ola leaves and parchment were distributed free, even though the books were available only for the few fortunate priests and the elite. It is the printing press which made the book a commodity, to be sold at a price, a Fast Moving Consumer Product, for businessmen to market and make a profit. After the arrival of the printing press, it was in 1971 that Hart gives readers the opportunity to access books free of charge. In 1971 he personally typed in the first eBooks, the Bible, works of Homer, Shakespeare and Mark Twain. During the 16 years up to 1987 he had keyed in 313 books, and with the help of many volunteers through the University of Illinois PC User Group, by 1998 he had 1,600 eBooks online. Still he was just dismissed by many people as “that crazy guy who wants to put Shakespeare in a computer”. But the ‘Crazy guy’ soon had 17,000 eBooks on Project Gutenberg. However, in 1998, people who wanted to keep knowledge and books away from the general public managed to take over one million books out of the public domain, with the Copyright Extension Act, extending copyright up to 95 years. Richard Poynder who interviewed Hart on March 9th, 2006, had this to say after he finished the interview, “What it reveals is a man whose whole life has clearly been dedicated to defending the public domain, but who is sometimes a little hard to fathom”. A little hard to fathom, probably because he was ahead of his time. His mission statement was “Encourage the creation and distribution of eBooks, Help break down the bars of ignorance and illiteracy, Give as many eBooks to as many people as possible”. His mission is to receive a lot of help with the coming of e-book readers, and the facility offered in android phones to read eBooks. According the International Data Corporation there were 12.8 million eBook readers by 2010. One more facility available is ‘Calibre’, (calibre-ebook.com), which can convert many eBook formats to many other eBook formats, manage our eLibrary, and Syncing support for eBook readers. On July 16, 2011, at 04.38 hrs, Michael S. Hart had written to Brewster Kahle, about “A Graceful Exit”, that he had accomplished all his goals, his career chosen in eBooks has been a success in terms of what he has been trying to accomplish for the last four decades. Then he goes on to say that he has set one more impossible goal, as he is faced with limited time, limited resources and declining energy levels. His goals were “1. A Billion eBook Library, 2. Spending more time in Hawai, 3. Working to create a graceful exit”. The Billion eBook library was based on the premise there are 25 million books in the public domain, converting 40% would give 10 million eBooks. There are 250 languages with over one million speakers, 40% will be 100 languages. 10 million eBooks translated into 100 languages yields ONE BILLION eBOOKS! In this message Hart also lamented that he did not personally believe the world at large really, sincerely wants to provide literacy and a education to anyone in the Third World, in spite of all the lip service to the contrary. Michael S. Hart died on September 6, 2011. Two months before his death, in July 2011, he had written, “One thing about eBooks that most people haven't thought much is that eBooks are the very first thing that we're all able to have as much as we want other than air. Think about that for a moment and you realize we are in the right job”. “...Hart's house in Urbana was stacked, floor to eye-height, with pillars of books. The man who spent a lifetime digitizing literature lived amidst the hard copies, which he often sent home with visitors. It was one more way for him to share his books”, wrote Emily Langer, in the Washington Post. 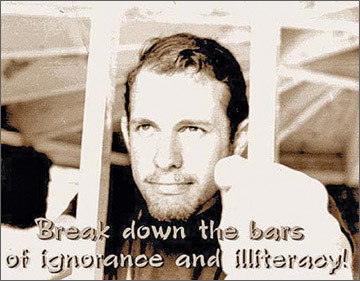 In the document prepared by his family after his death, there was an image of Michael S. Hart “breaking down the bars of ignorance and illiteracy”. Our tribute to Michael S. Hart should be our own contribution to break down the bars of ignorance and illiteracy. We can contribute in many ways, by volunteering to add more books to the Gutenberg Project, by sharing our books with everyone, by encouraging more writers to add their works to the public domain, to reach Hart's one million eBook target. I feel proud that Michael and I were born on the same year, same day, but when I think of what he had achieved and his contribution to mankind in his short life of 55 years, I also feel ashamed of myself and guilty, about my failure to contribute anything worthwhile .